Typhoon Talim is centred about 200 miles west of Kadena, Japan. Talim is tracking towards the northwest at 8 mph, having highest sustained winds of 130 mph. 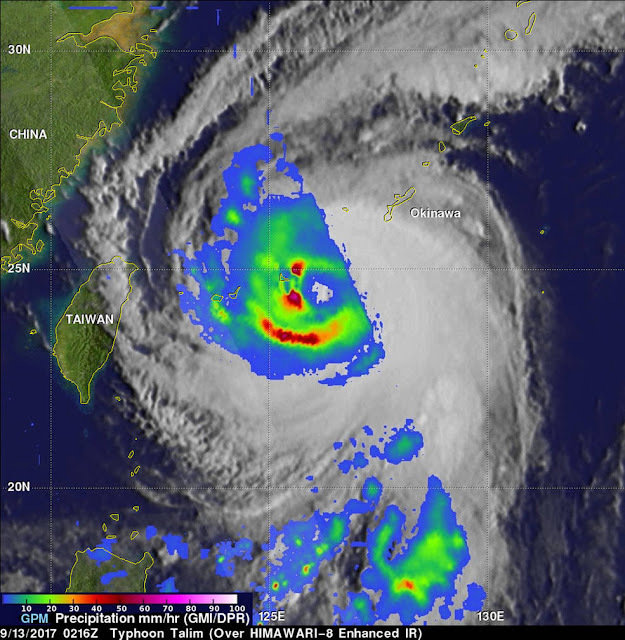 Talim is forecast to reach peak intensity within about 24 hours as it veers northward over the open East China Sea. By Friday, Talim will begin to weaken as it accelerates northeastward, crossing mainland Japan from southwest to northeast. Kyushu could suffer a destructive blow of damaging winds and flooding rains with a direct hit from Talim. Beyond Kyushu, Talim will weaken markedly as it begins a speedy transition to post tropical by the time it leaves northern Japan Sunday night or Monday. Meanwhile, in the South China Sea, Typhoon Doksuri is centred about 260 miles east of Da Nang, Vietnam. Doksuri is tracking towards the west-northwest at 14 mph, has maximum sustained winds of 75 mph. 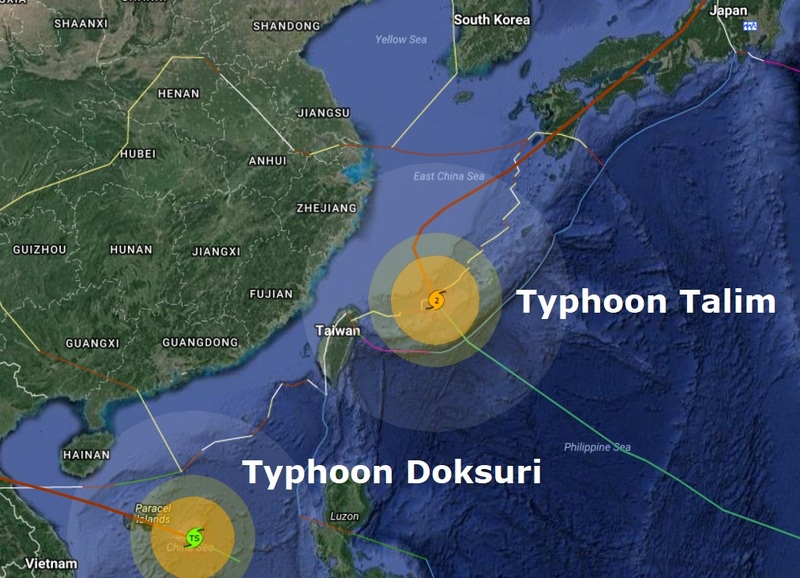 Doksuri will be a strengthening typhoon as it skirts southern Hainan Island, China, on Thursday and Thursday night, local time, then will make landfall on the north-central Vietnam coast on Friday. Destructive winds and flooding rains will pose a serious threat to life and property in areas along and near landfall in Vietnam. Inland, Doksuri will weaken quickly over highlands, losing its severe winds. However, excessive rainfall can extend into Laos.